Integrated Pest Management for Cultural Heritage is a practical, color- illustrated, working handbook for the curator, conservator and all persons concerned with the management of collections. It is an essential guide to the recognition of insect, rodent and bird pests with advice on the practical steps required to prevent and control damage to collections. While presenting the latest information on the trapping and detection of pests, the author explains the advantages and disadvantages of physical and chemical control measures including concerns about the use of pesticides and their effects on staff and the environment. In addition he demonstrates that Integrated Pest Management (IPM) is not only a safer option but also a more cost-effective solution to the complex problems of pest control. This book offers comprehensive guidance for the treatment of any pest problem likely to be encountered in museums, archives and historic houses. 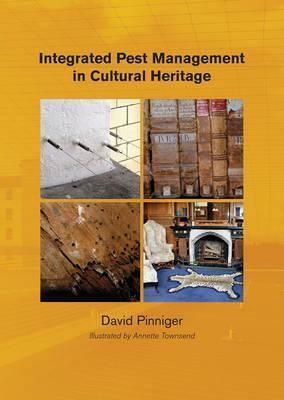 Contents: Chapter 1: Introduction to Integrated Pest Management in Cultural Heritage - What is Integrated Pest Management? ; Key components of Integrated Pest Management; Developing a strategy; Preventing pests; Recognising pests; Assessing the problem; Solving pest problems Implementing Integrated Pest Management Chapter 2: Insect pests - Why are insects pests? ; What are insects? ; What are the Pests? ; Pests which attack wool, fur, feathers and textiles; Herbarium collections, dried food etc. ; General detritus feeders, mould feeders and scavengers; Woodborers; Termites; Mites Chapter 3: Insect detection and monitoring - Where do insects come from? ; What to look for? ; Insect traps; Pheromones; X-rays and incubation Chapter 4: Prevention of insect infestation - Exclusion; Environment; Hygiene; Storage; Quarantine Chapter 5: Control of insects - Options for treatment; Insects in buildings; Cooling; Humidity; UV traps; Biological control; Insecticides; Insects in objects; Physical Control; Freezing; Heating; Nitrogen; Oxygen scavengers; Carbon dioxide; Radiation; Insecticides; Fumigation; Damage to objects by chemical treatments; Residues and risk from past treatments Chapter 6: Rodents and Birds - Rodents as pests; Rodent lives; Detection; Preventing infestation; Rodent control; Birds Feral pigeons, sparrows and starlings; Management of birds; Repellents and deterents; Other vertebrate pests; Bats Chapter 7: Implementing Integrated Pest Management - Pest Control Strategy; Museum Practice; Risk zones; Resources; Collection Policy, Museum Objectives & Functions; Interaction with Other Museums; Insect problems in tropical climates; Age of Collection and Buildings and Special Constraints; Training and Communication; Pest control contractors; The future References and further reading; Glossary; Index.